For pregnant ladies diagnosed with gestational diabetes, it’s not the end of the world! In fact, with a dietary focus on controlling carbs that lead to high sugar content in the blood, a diet regimen of gestational diabetes recipes can be the start of a healthy lifestyle than can extend long after giving birth to your child. Limiting your diet to certain types of food at a time when your pregnancy tends to give you more food cravings than before may be an imposition to your lifestyle. But consider it an investment, not just in ensuring your gestational diabetes doesn’t worsen into a full blown type 2 diabetes mellitus, but also to having a healthy child. Spending some time online to check out those gestational diabetes recipes can help you choose which comes closest to your palette when cooking the right dishes for your condition. Pregnant women, especially during the later trimester, may not be disposed to cooking at home and prefer to dine out or have the food ordered online and delivered. If you do, know that most foods in restaurant chains may have higher MSG, salt, trans fat and carb content than those you cook at home. But if know what to order, dining out or having your food delivered can be a healthy eating experience. Considered by most as a healthy fast food, those raw tuna and salmon sashimi may be rich in omega-3 oils and lean protein meat, but pregnant women are generally advised to stay clear from them for possible risk of contracting listeria, a serous bacterial disease. But other favorite Japanese cuisine can be delightful in a gestational diabetes diet. Order those broth-cooked yosenabe dishes (seafood and vegetables and sukiyaki dishes (meat and vegetables). They are both low fat and scrumptious. Take sushi rice in moderation or not at all as they are white rice – opt for brown rice if you have a choice and eat less of it. Italian food has a broad range of culinary flavors and styles from pizza to pasta, and grilled meats, vegetable dishes, and salads in between. Take pasta and risotto dishes in moderation as they are also carbohydrate rich – choose less of them and more of the vegetable and meat portions. Pasta tossed with seafood or vegetables with a bit of tomato sauce is just fine but be sure they are not drowned in rich buttery dressings or sauces. See if you can order the pasta separately from the sauce. Pizza topped with yummy fresh herbs and vegetables, Parmesan cheese, fresh tomato or arugula make for safe meals and recipes. Mediterranean dishes generally involve a healthy blend of lean meat and vegetables. Fresh souvlakia, kebabs and other grilled dishes are excellent options for meat lovers. Take the salads on the side rather than the traditional eggs or cheeses. Lebanese breads have low sugar content, and so do Greek stifado and moussaka dishes which have a great flavor with a lower amount of carbohydrate. There are other culinary delights from Chinese, Thai, Vietnamese, Indian and European dishes that can really whet your appetite. You just need to know which recipes to take. 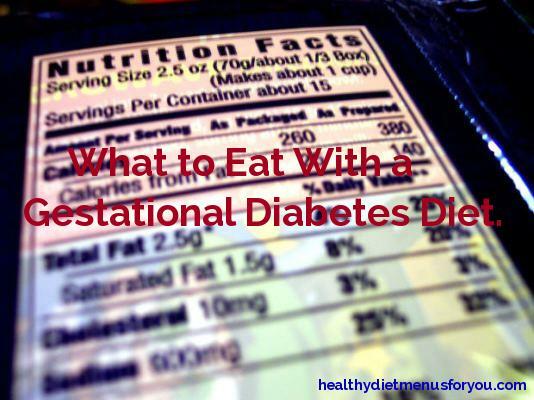 Having the right gestational diabetes recipes in dining out or having the food delivered is all about limiting the often rich carb content that gets metabolized as sugars to aggravate your condition. Enjoying a hearty meal out with your spouse or friends can be both fun and healthy if you take food in moderation while limiting your choices to low carb and low sugar recipes. Click HERE FOR A GESTATIONAL DIABETES MEAL PLAN AND RECIPES, if all these sound absolutely crazy then see my own meal plan and recipes, developed by a gestational diabetes mom and Registered Dietitian!